Enjoy luxury living at its finest in the Active Adult community of Trilogy at Vistancia. This ”Suscito” model was built in 2008 has 2 bedrooms, 2 bathrooms and separate office space. Upon entering the home you’ll immediately feel welcome with its grand hallway leading to the highly desired great room concept. The gourmet kitchen is complete with gorgeous raised panel cabinetry, stainless steel appliances, gas cooktop, granite countertops and full backsplash. Friends and family can gather around the large kitchen island or in the formal dining room, making entertaining a breeze. Gas fireplace to ensure cozy Arizona winter nights. Spacious owners suite with bay window and neutral pallet leads to upgraded master bath. Dual sinks and l custom tiled shower with frameless glass. Split guest bathroom with tile shower, upgraded fixtures and tile counter top. Right off the Great room is access to the outdoor living space where the over sized covered patio provides indoor/outdoor living. 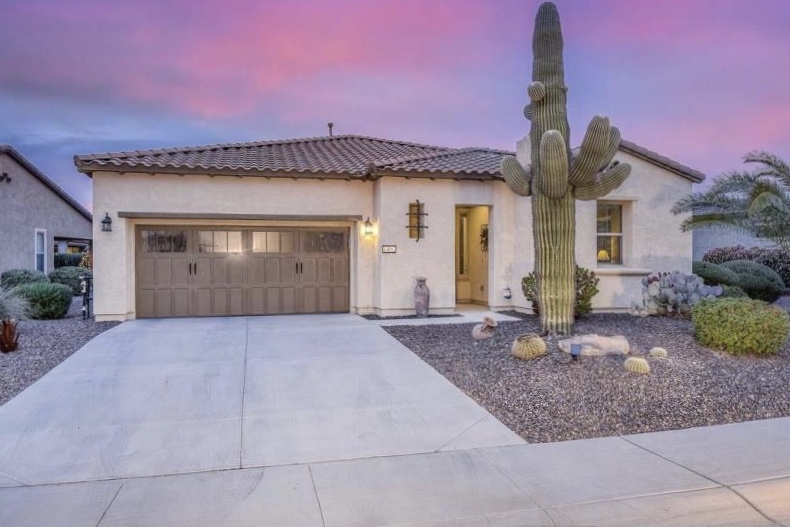 Ample outdoor space with desert landscaping complete with citrus trees. Plenty of storage space with walk in pantry and laundry room loaded with cabinets!